This Product has been discontinued from manufacturer. Blend is an integrated developement board, we have "blend"ed Arduino with Bluetooth 4.0 Low Energy (aka BLE or Bluetooth Smart) into a single board. It is targeted for makers to develop low power Internet-Of-Things (IoT) projects quickly and easily. Blend is 100% compatible with sketches and Shields that work with Arduino Leonardo. 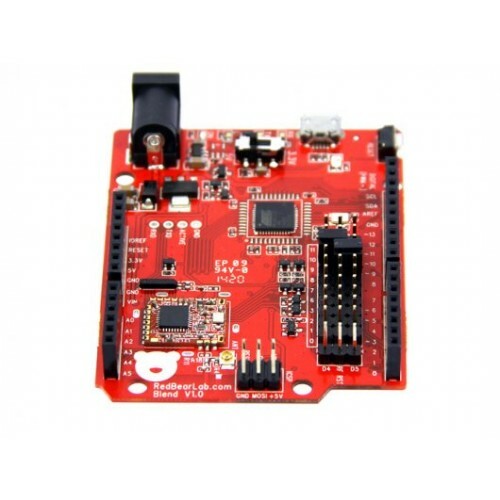 The micro-controller unit (MCU) is Atmel ATmega32U4 and the BLE chip is Nordic nRF8001. Blend runs as BLE peripheral role only, it allows BLE central role devices to establish connection with. otherwise you will damange the board. The nRF8001 chip communicates with ATmega32U4 through the ACI (Application Controller Interface). The ACI is similar to SPI but not actually works as SPI. SPI is consist of MOSI, MISO, SCK and SS, whereas ACI is consist of MOSI, MISO, SCK, REQN and RDYN. Since the nRF8001 chip may receive data anytime even not selected by SPI master (Atmega32U4), so the SS line is not needed. For the ACI, data exchange still through MOSI and MISO, and SCK provides the clock generated by master. When master wants to request data from BLE Shield, it puts the REQN to low until RDYN line is put to low by BLE Shiled, and then master generates the clock to read out the data. After reading out the data, master will release the REQN and BLE Shield release the RDYN, put them to high. If the nRF8001 has data to transmit to master, it will put the RDYN to low to indicate master, even though the master has not requested data and REQN is idle. If the master detectes a low level condition on RDYN, it will put REQN to low and generate the clock to read out the data. After reading out the data, both REQN and RDYN will be put to high. Note that REQN is controlled by master while RDYN is controlled by the nRF8001 chip. According to the Atmega32U4 specification, the MCU can run at either [email protected] or [email protected] Normally, you should set the voltage selection switch to 5V to run the board at 16MHz. However if you need to connect to shields or external components, such as sensors or MCU, which accept 3.3V only, you should change the operating voltage to 3.3V using the voltage selection switch. Note that while Blend is running at 3.3V, the Atmega32U4 will still run at 16MHz which is outside Atmel's specification, the CPU is overclocked (we have not seen any issue so far).